Cheer Zone became a reality in January of 2000. Our first day open was the day that Owensboro was hit by a tornado (good luck huh?!? ... yeah that's what we thought too). We leased a small building on 2nd street and purchased a 42 x 42 foot competition floor, an above ground 40 foot Tumble Trac, and wedge. We soon outgrew that location and began plans to build a new, larger gym. On April 2001, we moved into our new custom built gym in the recently developed Heritage Park Complex. Our new gym allowed us to acquire more equipment which enabled us to expand our All Star program and add more classes. With the bigger gym, we needed and hired the great staff members we had and have now. The Cheer Zone All Star program has grown better and stronger with each year. 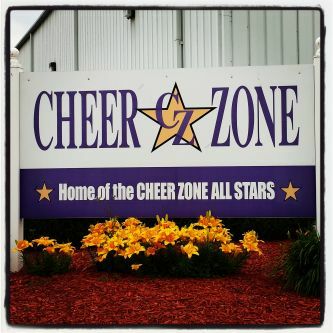 Cheer Zone has helped countless cheerleaders see their dreams come true both in All Stars and in the school programs. Through the ahtlete's hard work and dedication many have won regional and national championships and also have made their middle school, high school and/or college team. With all the hard working cheerleaders, great local talent, and the unreal support and work of the parents ... Cheer Zone should only continue to grow and thrive. And to all those that are currently or are past Cheer Zone members, we offer our sincere thanks!! !